Oris is pleased to announce a limited edition watch made to celebrate the achievements of Williams Formula 1 driver Valtteri Bottas. The Williams Valtteri Bottas Limited Edition has a carbon fiber case and is limited to 770 pieces. Valtteri Bottas will race for the Williams F1 team for a fourth consecutive season this year. The 26-year-old Finnish driver secured his seat in 2013 after a successful spell as official reserve driver. His first podium came in Austria in 2014, and going into the 2016 season he has amassed eight podiums and 326 points from 57 Grand Prix, with a highest championship finish of 4th in 2014. The watch marking Bottas’s achievements joins the Oris Williams collection, launched in 2015. Each piece in the line has been designed to reflect the speed, power and technology of Formula1. The Williams Valtteri Bottas Limited Edition picks up from the Oris Williams Chronograph Carbon Fiber Extreme. 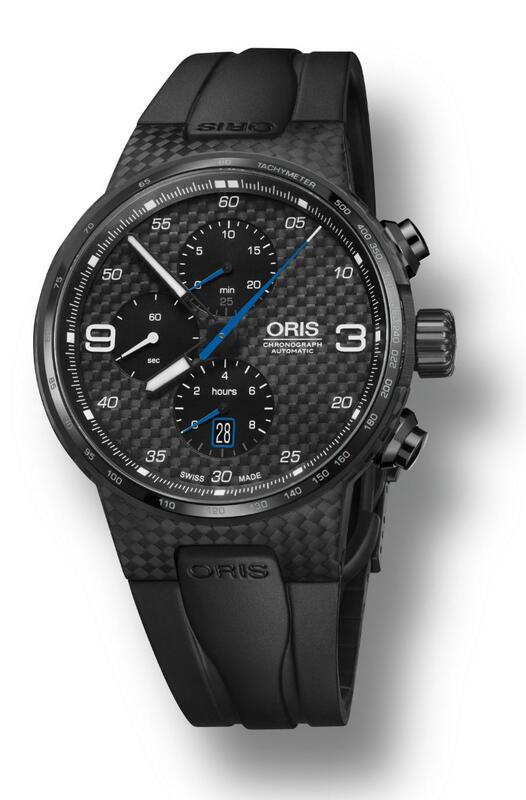 It has the same 44mm carbon fiber case made using an Oris-patented manufacturing technique adapted from Formula 1. To make this unique, high-performance carbon fiber case, sheets of woven carbon fiber reinforced polymer are layered manually in individual moulds in two steps and then twice hardened at 130°C in special ovens. Each watch middle case weighs just 7.2 grams only. In addition, the new model also has a carbon fiber dial and a streamlined rubber strap that mirrors the aerodynamic design of a Williams F1 car. 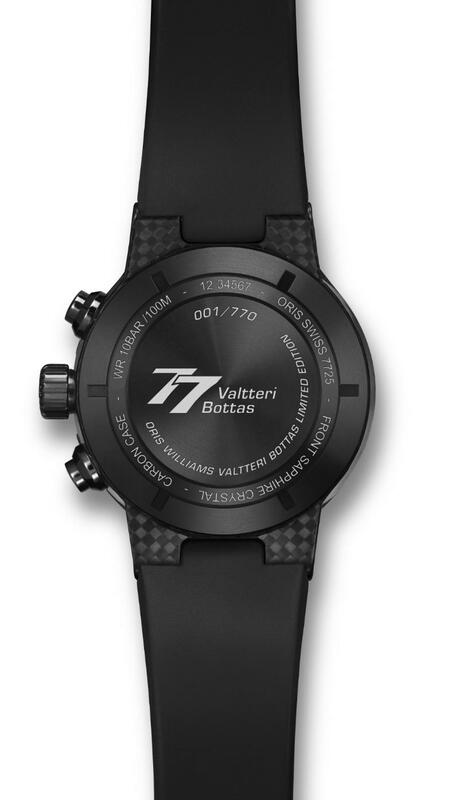 The case back is made of black DLC-coated titanium, and is engraved with 77, Bottas’s car number, and his name. The folding clasp is also made from black DLC-coated titanium.